The conclusion reached on reading this book is that a thorough analysis of the relevant production in connection with other classes by ceramic context can offer numerous fresh and interesting ideas, which take on special significance when catalysed by the sieve of stratigraphy. 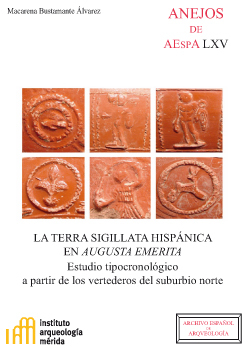 We are also sure that this kind of work will come to the fore in Hispano-Roman ceramics, which unfortunately has not been the general case to date; nevertheless, things have been changing over the last few decades. This is because, in most cases, the misunderstood shortcomings and sensitivities of archaeologists leading digs do not allow researchers to have all the information they need to undertake a study with all the variables available. This is a good example of the opposite case, which has been made possible by the author's character, which combines seriousness and Prussian discipline with Mediterranean know how, thus opening doors closed to others. Portae panduntur is what is needed n our discipline, and each of us to leave to our individual ager, so as, in an interconnected way, to collectively construct the economic history of Antiquity, which was, like all historical processes, much more complex than we originally thought, and which we aspire to reconstruct with tentative signs, many of which come from the study of ceramics. This book was added to our online catalog on Monday 04 November, 2013.